END OF JUNE. ARE THERE MORE SEA TROUT TO COME? We have been tickling away all week with one or two sea trout each night, after the six we caught on Monday. There are sea trout in all the pools, but not many. 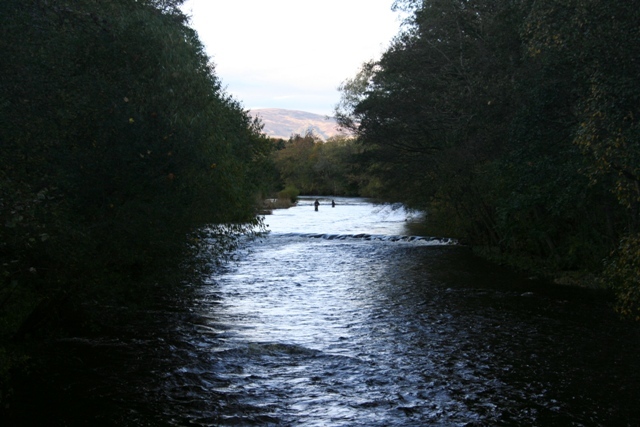 I am interested to see whether the main run is yet to come because, by any measure, this has been a strange year with warm water from the beginning of the season and sufficient water in the river to allow sea trout and salmon to swim upstream without any problem. This photo was taken from the suspension bridge at the tail of Casdtle Stream, just above Red Brae. You are looking upstream towards the Flats where there are two peopole fishing. Conditions at night are now perfect for the night angler. If there were shoals in the main pools we would probably be catching them in good numbers, but those shoals, as far as we have observed, are only intermittently present. I remember a night in 1988 when I ‘found’ a shoal of sea trout in the tail of Tyndals Pool at about 0200 and caught seven of them before the dawn came. I had not seen those fish lying on the gravel in daylight. It is possible that they had arrived during the hours of dusk ness (there’s no darkness in June in Scotland) but I think not. That shoal of sea trout in my opinion had been there all the time, just lying quietly in the quiet tail of Tyndals. Which just goes to show that sea trout are mysterious and secretive fish that keep themselves to themselves, and normally are very difficult to spot. As the South Esk falls away to its summer low level the movement of migratory fish into and within the catchment has declined. As always with our little river, we now need rain to freshen up the system and encourage new fish, fresh from the sea, to enter the river. Until that happens I suspect all will be very quiet. I see that some rain is forecast for later in the week. By then we will be needing it badly. The season to date at FCW has seen 37 salmon (biggest 16lbs) and 46 sea trout (biggest 5lbs) recorded.